My name is L., but friends call me RunningWolf. I started by accident one summer afternoon, I was twelve year old, not yet really, and dew was covering my skin. At half past six on a Sunday in July, I kicked the door open and started following the direction of the wind. I found myself that day on empty streets and paths moist with tears and rain, going through the pink sky at sunset and the smell of freshly picked grass. I was running after dreams and clouds to escape the offenses, looking for shelter from the fear of being and my almost teenage anger. I then ran for a time that seemed endless, amid furtive and guilty kisses, Sundays devoted to feast and exclusive friendships sworn forever. I ran for boredom, futility and shame, chasing a scent of rebellion that didn't belong to us anymore. I ran through my twenties, in the heart I was carrying one single memory always too close, and in the head eternal fantasies of freedom. I ran to the notes of an off pitch violin, to the verses of poems recited to the moon, dreaming of a romantic future that corresponded to my reality. I ran alone and at night to escape ghosts and mirrors; I, whom no-one ever saw staying up late, was confusing and mixing this way darkness and dawn. I ran on ice in the winter to mask the cold coming up from within, and from my frozen lips I blew away insecurity and pride. I ran to forget, bury and forgive; I ran for redemption, devotion and renunciation. Then one day I ran 26 miles in a row, my calves hardened by fatigue and my mind scared by the wall and concrete. I ran alone with a thousand people, fifteen years in a few steps through a handful of neighborhoods, and on that day I found myself at the finish line. Roughly chop pecans. 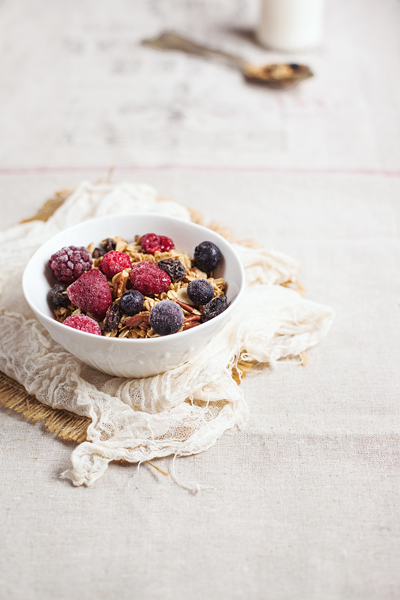 Mix them with oats, almonds, coconut and sugar. In a separate bowl, mix maple syrup, oil and salt. Pour wet ingredients over the nut mixture, and mix well. 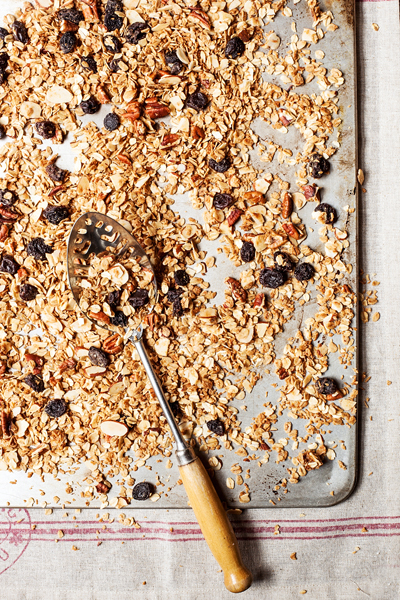 Place granola on two baking sheets and bake at 250 for about 1 hour and 15 minutes, stirring frequently so that it gets a uniform color. Allow it to cool down, then add raisins. It will keep for weeks in an airtight container; eat it with milk or yogurt, and/or fruit. 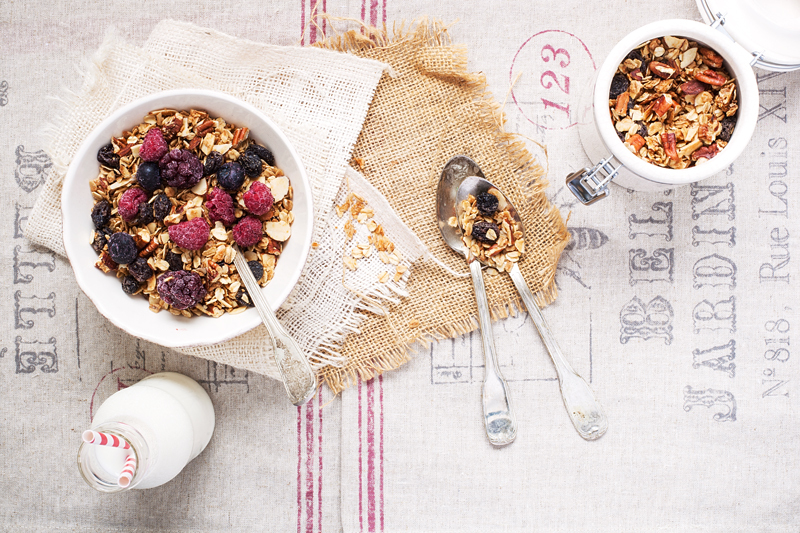 Granola is pure crunchy energy. Early in the morning it gives wings to your feet. Word of a running wolf.